Vermilion Falls is a cascading torrent of water forced through a 10-foot wide opening in the granite. It is part of the Vermilion River which runs north 40 miles from Lake Vermilion and empties into Crane Lake through the Vermilion Gorge. The 3/4 mile round trip trail to the falls and observation deck is accessible and passes by three picnic sites which overlook the river. You may bring a portable charcoal grill or campstove for cooking at the picnic sites. Please pack out all trash and protect this fragile area. The rugged, original Vermilion Falls trail is still maintained for hiking. From the Picnic Area parking lot, go left on the portage a short distance and continue down river on the hiking trail to see some lovely views of the Vermilion River. The old trail is steep in places and crosses some ledge rock on its way to Forest Road 491. From the small parking area on Forest Road 491, cross the road and continue on to "the chute," a constriction in the river that produces a class III - V rapids. Part of the trail also serves as the portage around the rapids. On your return to the falls, spend a moment on the bridge looking upriver at the small wild rice bed in the bay to your left. In mid-July rice shoots begin to emerge from the water, and seed heads begin to develop in the first part of August. Extensive wild rice beds (wild rice is really an aquatic grass, not a rice) flourish along the Vermilion River and the rice is harvested by humans and wildlife alike from late August through October. 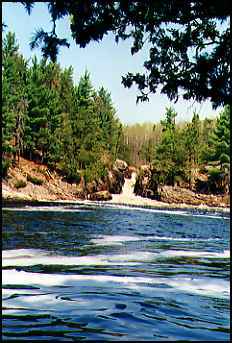 Vermilion Falls is located 27 miles northeast of Orr, MN. From Orr, take St Louis County 23 to Buyck (16 miles). At Buyck, Country 23 turns into County 24. Continue on County 24 for 5 1/2 miles to Forest Road 491. Turn left for 5 1/2 miles to the Vermilion Falls Recreation Area access road. Turn left for 0.3 mile to the parking lot.